Slow As The South: Literary Tour Guide to the United States Books - THe SOUTH! NORTHEAST! MIDWEST! 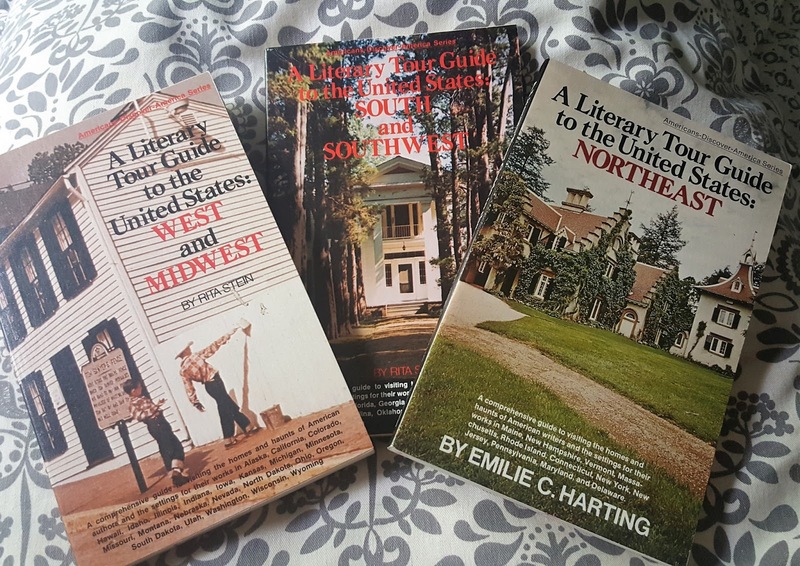 Literary Tour Guide to the United States Books - THe SOUTH! NORTHEAST! MIDWEST! This weekend my husband and I went out and hit up some garage sales. It was a nice Saturday for getting out and we hadn't been to a garage sale in a long time. We hit up about 10 different sales and found a few good deals. While visiting one sale that I believe belonged to a former English teacher, I came across three books that I was obviously meant to find. I had never heard of the "A Literary Tour Guide to the United States" books before. They are a part of Americans Discover America Series. There were three of them - The Northeast, The West and Midwest, and South(!) and Southwest. I was surprised to see Target stickers from long ago still on the books. The books are in excellent shape considering the age. I had to check out my own state of Kansas in the West and Midwest volume (by Rita Stein) to see what was highlighted. It is a sad little chapter that focuses mostly on William Allen White but makes mention of Langston Hughes growing up in Kansas for part of his life. I checked out the South and Southwest volume (by Rita Stein) most extensively as my southern literature, southern gothic in particular, is my absolute favorite genre. There was mention of many of my favorites including William Faulkner, Eurdora Welty, and Flannery O'Connor. Flannery O'Connor is an absolute favorite and I have visited one of her homes in Savannah Georgia which has now been made into a museum. The Northeast volume (by Emilie C. Harting) covers many places that my husband and I toured when we did our Literary New England vacation a few years back. Walden Pond (Thoreau), Wayside (Nathaniel Hawthorne's home), Old Manse (Ralph Waldo Emerson & Hawthorne lived there), Louisa May Alcott's house (now also a museum) and the resting place of many literary greats all are in Concord, MA. If you love that kind of thing, it is a truly memorable experience. I can't wait to dig into these further and plot our next vacation spots!